There have been relatively few true real-time strategy (RTS) games developed for the iPad, but expect that to change soon. Autumn Dynasty is as playable as it is beautiful, setting a higher bar in the process. Although the campaign play is woven together with a simple but intelligent storyline, the crux of the game by Touch Dimensions is a large scale real-time military combat simulator set in medieval Asia. 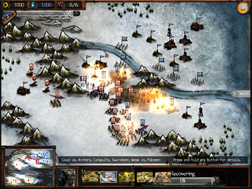 Players command units of swordsmen, pikemen, archers, horsemen, calvary, and catapults while building an infrastructure (forts, camps, outposts, towers, and farms) to expand their growing military. Anybody who has ever played any real-time strategy game ought to know the drill. Players want to build as much as possible, which aids in training a larger army. 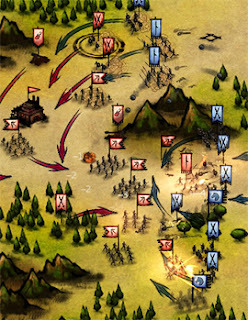 At the same time, it's likely they will have to defend their encampments against an increasing onslaught of enemy units. There are four ways to play the game: campaign, skirmish, bluetooth (iPad vs. iPad), and online. No matter which game play you pick, there is considerable attention to detail. It ranges from the storyline of a campaign to the single-player skirmishes that allow for one of three different artificial intelligence (AI) opponents. The artistic stylings of Autumn Dynasty makes it a standout game. Most real-time strategy games have to balance speed and art. Autumn Dynasty doesn't have to. By choosing a visually appealing minimalistic design, the game looks great without sacrificing speed. It plays out on a landscape that carries the simple but striking look of a Chinese ink wash painting, a timeless technique dating back to 600 A.D. The environment looks like it was inked and painted on parchment. The various units are simple while showing off some tiny, well-designed brushstrokes. The best part of the art is that it goes beyond merely mimicking the look of an ink wash painting. The entire goal of ink wash painting is to capture the soul of whatever is being reproduced. And as units are directed with the graceful lines of touchscreen orders, they do seem to come to life on the screen. The design and movements of the units and look of the buildings also make it even easier to forget that the game itself is based largely on rock-paper-scissors behind-the-scenes game play. It feels like playing a piece of history. Of course, there are other variables thrown into the mix. Called doctrines, Autumn Dynasty adds variables that include special training for each unit: improved equipment, building enhancements, special skills, and elemental magic. Each doctrine has numerous abilities and three tiers in each to provide units and buildings with more and more power. Making minute-to-minute decisions on whether to build, research, or train more units (and what kinds) is especially challenging in the single-player skirmishes. Most players will want to start with the campaign mode because it is as much a general a tutorial as it is game play with a decent back story. A small introduction to the campaign story of Autumn Dynasty. The nutshell version is that peace in the ancient Empire is threatened by a growing divide between the North and South. Rumors of unrest have prompted the bureaucracy (made up of farmers, nobles, and soldiers) that runs the Empire to commission an investigation. Then again, a looming civil war seems certain as the South has not paid its annual taxes. But nobody told Scholar Hsu, because he sets out to investigate on behalf of the North with nothing much more than a wagon. You know what happens next. Like any RTS that begins this way, some campaign scenarios are meant to be lost to advance the story. In this case, being robbed helps Scholar Hsu meet General Li. Mostly, protagonist Scholar Hsu (the player) is looked upon more and more like a leader (assuming the payer does well). Told primarily in a cut scene storyboard fashion, each captioned frame carries the theme of the ink brush art renderings forward, creating a very promising game experience. What isn't as straightforward is that it becomes increasingly obvious the developers built in a plot twist or two. Autumn Dynasty For The iPad Renders 9.1 On The Liquid Hip Richter Scale. Touch Dimensions has created a painstakingly detailed and very playable game with enough variations to keep the story from becoming too tedious. The ink brush painting concept is perfect, not only because it fits in with the medieval Orient, but also because it provides just the right amount of detail. It's also obvious that the game was specifically designed for tablet play; mastering a few gestures is simple. Touch Dimensions said its distributor, BulkyPix, will offer Autumn Dynasty at an introductory rate. Some people shy away from games priced at $5 or more, but this one is worth it if you like RTS games. The game was originally conceived in 2009, but dramatically improved with better unit graphics and the removal of the paint brush pointer.